Today’s recipe is sponsored by Unilever Ice Cream. 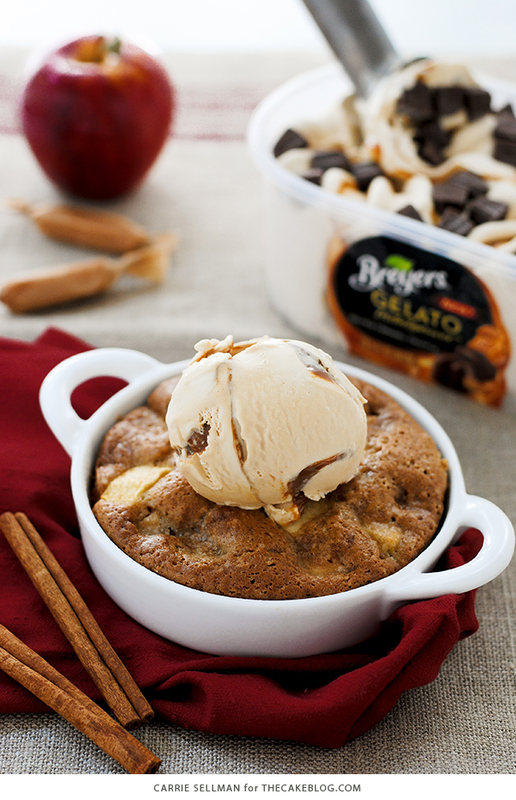 We’re celebrating National Dessert Day with Breyers® Gelato Indulgences™. 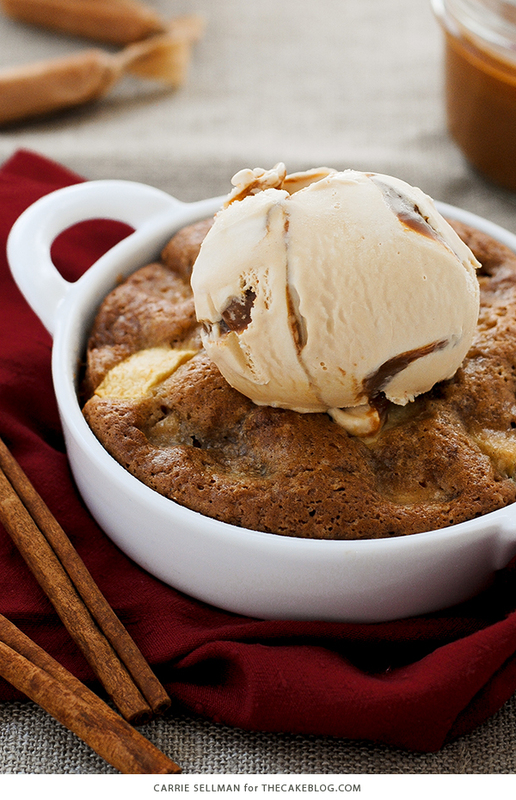 Yes, today is National Dessert Day! Like we need an excuse to eat dessert, but if you’re looking for an excuse, a national holiday sounds like the perfect justification. 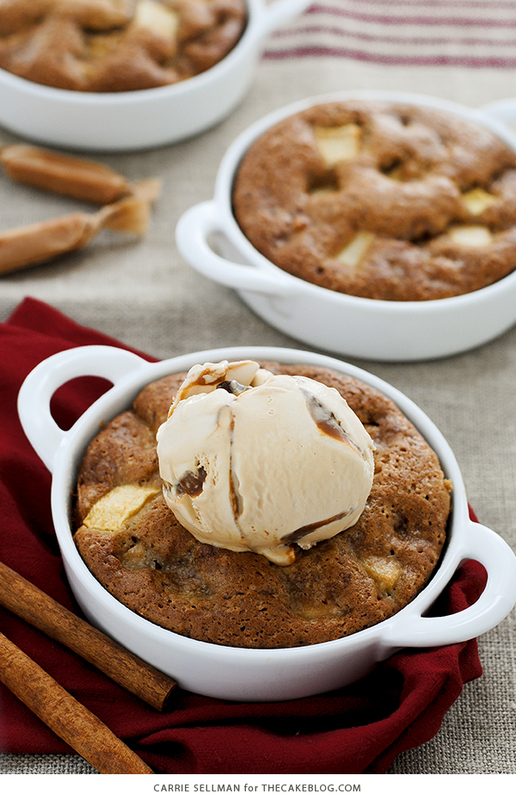 And this warm apple cake with chunks of apple, brown sugar and cinnamon will have you looking like a dessert-making rock star when you pull out freshly baked, individual bowls of heaven for the lucky ducks sitting around your table. Who does that? You do, starting now. 👊 When it’s as easy as a one-bowl cake batter, topped off with a scoop of salted caramel gelato that acts as a cold creamy frosting AND caramel sauce — there’s simply no stopping you on your road to dessert stardom. It all starts with the warm apple cake, which is one of those recipes you should definitely have in your arsenal. A simple, mix-with-a-spoon batter that comes together in a snap, with flavors that far outweigh your effort. The big chunks of apple, the warmth of cinnamon and the hints of smokey molasses from the brown sugar — it’s all the goodness of the season in each bite. Prepare the individual dishes so that they’re ready to hit the oven about 35 minutes before you want to devour them. As the apple scented aroma fills the air, those 35 minutes may feel like an eternity, but find strength in knowing that soon you’ll be lifting your spoon in triumph. Once the cakes have cooled enough to handle, top with a scoop of Breyers® Salted Caramel Truffle Gelato Indulgences™. If you’ve never tried gelato, think ice cream but elevated, with a silky smooth, ultra amazing texture. 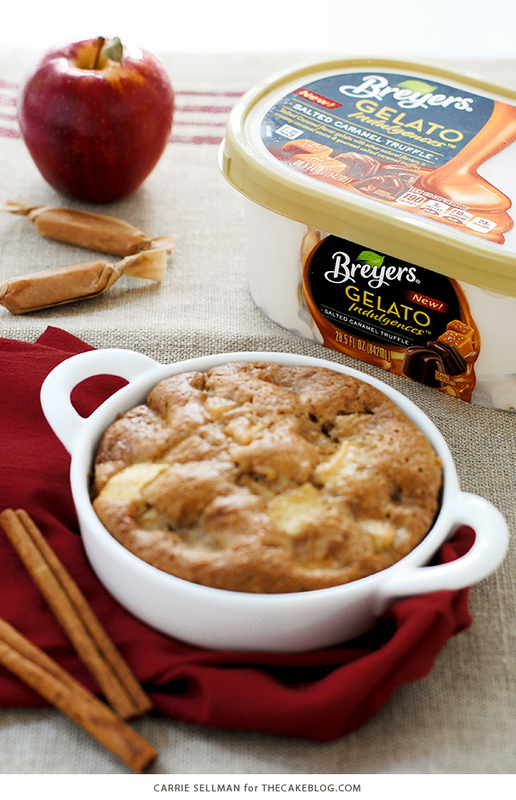 Breyers Gelato Indulgences combines a trio of textures: creamy gelato, luscious sauce and gourmet toppings — and the salted caramel flavor was MADE to go with this apple cake. Well, I guess technically it was MADE to be eaten by salted caramel lovers everywhere but this apple cake has seriously met its soul mate. Once on top, the gelato instantly starts to soften and becomes a creamy river of deliciousness laced with salted caramel drizzles. Who needs frosting when you can have gelato, salted caramel sauce and mini chocolate truffles all in one scoop. And don’t even get me started on the warm-cold tango that this little number serves up. It’s a dreamy creamy dessert worthy of National Dessert Day, or any day for that matter. Preheat oven to 350 degrees. Grease and flour 10 six-ounce baking dishes. In large bowl combine the flour, granulated sugar, brown sugar, baking soda, salt and cinnamon. Whisk to combine. Add all wet ingredients to dry ingredients: eggs, vegetable oil, sour cream and vanilla. Mix with wooden spoon until well blended. Batter will be very, very thick. Divide batter between 10 prepared baking dishes, ensuring each dish is no more than 2/3 full with batter. Bake for 28-33 minutes or until toothpick inserted in center comes out clean. Let cakes cool in baking dishes on a wire rack for 5 minutes. 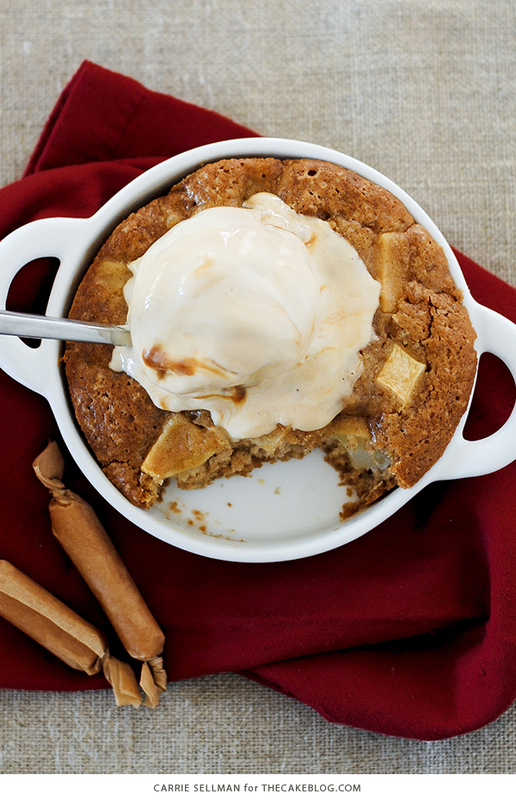 Top with a scoop of salted caramel gelato and devour while still warm. Cake batter can be mixed several hours in advance. Simply divide into prepared baking dishes, cover with plastic wrap and refrigerate. Bake when ready to serve. If needed, add a few extra minutes to the bake time to adjust for the batter and dish being cold. Alternatively, cakes can be baked in advanced and reheated in the microwave before serving. Microwave one at a time for roughly 20 seconds or until warm. I used a mix of Granny Smith and Gala apples, but feel free to use the apples you love most. Do not skip the gelato, it truly completes this dessert! This is a sponsored conversation written by me on behalf of Unilever Ice Cream. The opinions, text, recipe and photography are all mine. Dinner party coming up! This will be perfect! These would be great for a dinner party Elaine! not like i need an excuse to have dessert (; but this still sounds amazing! and i love that the cake is packed with apple so that it’s *really* an apple cake. Thanks Heather! 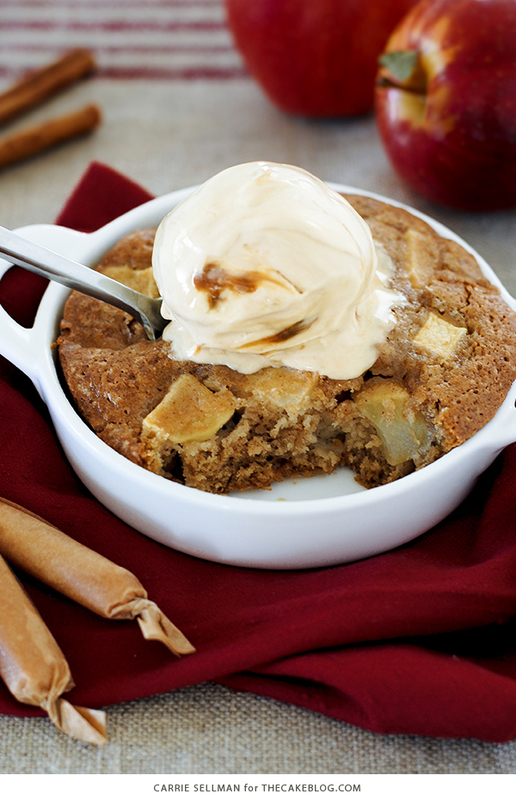 This is definitely a *real* apple cake – the best kind! Oh, wow! These look so GOOD! 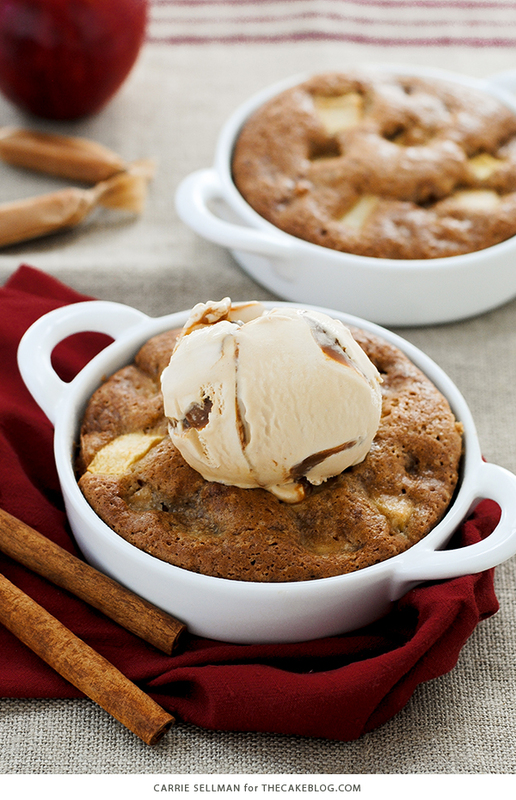 The apple cakes look wonderful and I’ll give them a try with my autumn harvest apples this week-end, but what a shame that there wasn’t a recipe for the ice cream……haven’t seen that brand here in UK. Will have to improvise! That looks absolutely delicious and the baking dishes are so cute. I am going to definitely try this! Can I bake this in a 9X13 dish and if so, for how long? Could I use this in two 9×2 rounds? Sure, just be sure not to fill the pans more than 2/3 of the way full.